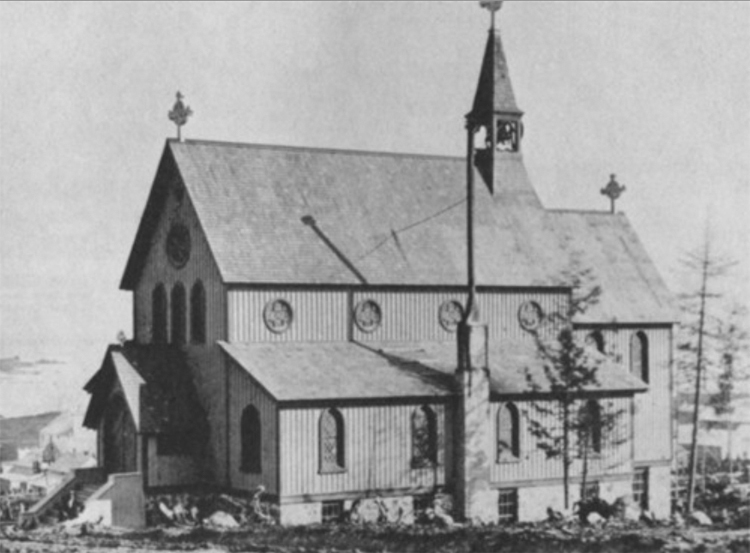 Completed in the fall of 1869, St. Paul’s Episcopal stood as Duluth’s first dedicated church building and held its first service on Christmas Day of that year. George Sargent, one of the Episcopalian elders who started the church, came to Duluth to act as Jay Cooke’s representative. Sargent named the Church St. Paul’s in recognition of the Cheltenham, Pennsylvania church Cooke considered his home parish. And so St. Paul’s in Duluth became known as “Jay Cooke’s Church.” The Pennsylvania church even paid for the Duluth church’s baptismal font, made of brownstone cut from a Fond du Lac quarry in 1872. St. Paul’s was a wooden building, probably designed by the carpenters who built it, with Gothic-style windows on the first story, round windows above, and a small belfry over the roof near the back. 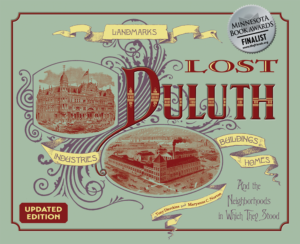 In 1869 it stood alone atop the hillside, overlooking the growing village of Duluth. The 1869 St. Paul’s served Duluth’s Episcopalians until 1913 when the congregation had grown so large a new building was necessary. Lots were purchased on East Superior Street and Seventeenth Avenue, and the new church (designed by renowned architect Bertram Goodhue) opened in 1913. The 1869 building was vacated in 1912 and demolished in June 1925 for a parking lot.